It's time for another list of great games you can play for free in your favorite internet browser. Make sure to check out the first list if you haven't already. Click on the name of the game to play! This game is also a multiplayer battle game, although instead of narwhal horns, the weapons are penises. You can choose from three sizes: small, medium, and large dicks. Oh, and there's a projectile dicks mode. Also, click here to check out Pippin Barr's other games. 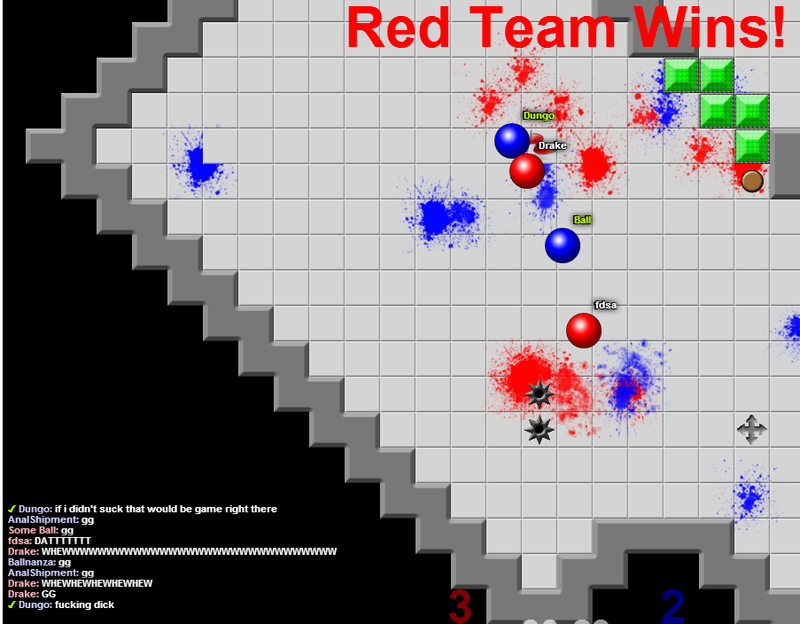 TagPro is an intense tag/capture the flag game between two teams. Don't let the simplistic graphics fool you: this game can get brutally competitive. It's easy to jump into a game and start playing, although if you take the time to sign in, you can track stats and add friends. 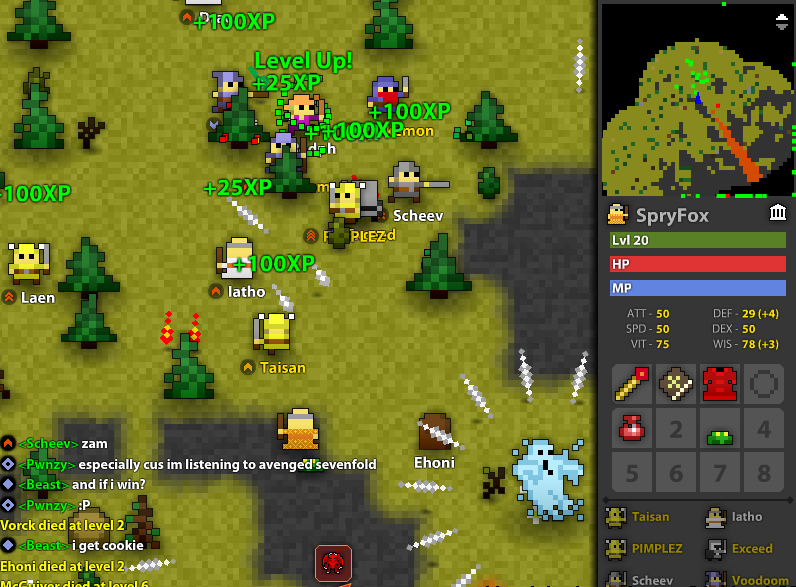 RotMG is a genre-blending MMO. It has RPG-style experience points, rogue-like permadeath, and the chaos of a bullet hell shooter. I remember hearing about this game back when it was released, but I'm only just checking it out now. As of February 19th, the game is currently down. Hopefully it gets back up and running soon! I remember enjoying this game back in high school. While it's a little dated, KoL is still as funny as ever. It's a mock-RPG with exploration, combat, stats, and many other staples of the genre. What sets this game apart is the overload of humour and puns. For example, when starting the game, you may speak with the Toot Oriole (get it, tutorial). Character classes include the Sauceror, the Pastamancer, the Turtle Tamer, and the Disco Bandit. No matter what you thought of Flappy Bird, it was immensely popular and well-covered in the gaming (and regular) press. While I don't find the game particularly fun, I was glad to at least get a chance to try it out since the original game has been removed from the app store. 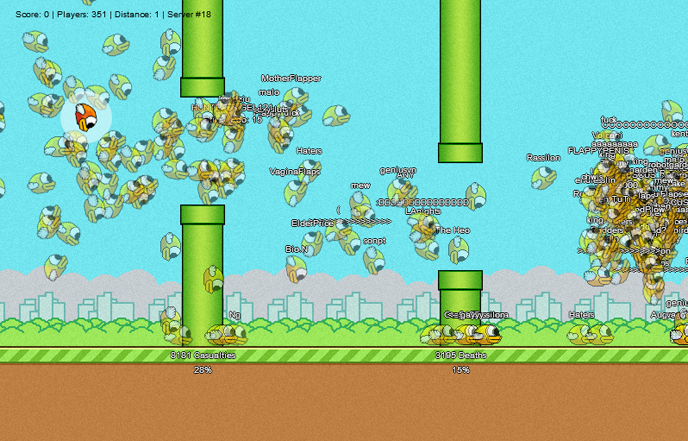 Flappy MMO lets you flap simultaneously with other players (who you see as semi-translucent birds) as you attempt to get past those green Mario pipes. Check out the game and share the frustration. Radical Fishing by Vlambeer is awesome. In it, you must dodge fish when lowering his hook into the ocean then catch the most fish when pulling up the hook. The fish are then flung into the air, at which time you shoot them to smithereens. Nonsensical, fun, and boasting a good variety of upgrades, this game is sure to entertain you. There's also a shiny remake in the app store called Ridiculous Fishing. This funny little collection of games places you in the shoes of classic Greek figures such as Prometheus and has you play minigames based on their myths. Also, click here to check out Pippin Barr's other games. Gonzalo Frasca is a journalist who had something to say. 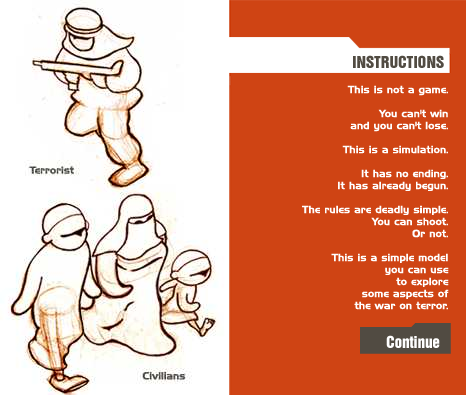 He didn't like the US's response to terror, so he made a newsgame about it. While it isn't technically a game, the fact that you can't win is very much intentional. Games have a long history of being used as political or activist messages, but that's a subject for another time. In the case of September 12, making a game was an effective way, if not the best way, of getting the author's point across. This game was recommended to me by a friend in the comments of my first free browser games list. It's a platformer with a charming old-school GameBoy aesthetic. It's a tough game, but plays with rules and restrictions as you progress. Definitely worth checking out. Terry Cavanagh, creater of Super Hexagon and VVVVVV, has made a ''Flappy Bird tribute game'' that adds mechanics, variety, and neon colors to the hit game. This fan game improves upon its inspiration.